Although it’s too early to draw conclusions, data suggests that the 2018/2019 flu vaccine has been a good match against the main strains going around, and this year’s season is shaping out to be milder than last’s. Even so, the latest reports from the CDC show that the flu is still widespread across the U.S., and the season could extend until May. So we’re not quite out of the woods yet. Although my household has avoided the flu so far, we’ve still had our share of colds and stomach bugs in the past few months. Ugh. That being said, we’re doing everything in our power to stay healthy, and eating well plays a significant role! While consuming a balanced diet that includes plenty of fruits and vegetables and protein is the best strategy for getting the nutrients you need, research has shown us that some nutrients in particular are important for a strong immune system. These immune-boosting nutrients include zinc, selenium, iron, copper, and vitamins A, C, E, B-6, and B-9 (folic acid). Probiotics have also been identified as potentially immune-boosting. While it may be tempting to pop a multi-vitamin and call it good, the research is clear that when it comes to nutrients, whole food sources are best. So here is a list of 10 foods to include in your diet to ensure you are getting the nutrition you need to stay healthy during these long, cold winter months! Spinach – This favorite leafy green is high in iron, selenium, folic acid, vitamin C, and vitamin A. Throw it into a smoothie if you’re not fond of it otherwise. Red bell peppers – Did you know that red bell peppers are higher in vitamin C than an orange? Slice peppers into strips and eat raw with hummus or put into a stir fry for dinner. Sunflower seeds – These little seeds make an excellent salad topping or trail mix addition, and are high in copper, selenium and vitamin E.
Garlic – The cold and flu-fighting benefit of garlic is thought to come from allicin, a compound that is formed when garlic is crushed or chopped. Studies suggest allicin may help prevent a cold or flu, and reduce its severity if you do get sick. Almonds – A handful of almonds makes a perfect mid-morning snack. Like sunflower seeds, they are high vitamin E, copper, and also zinc. Chicken or turkey – The notion that chicken noodle soup is good for a cold goes beyond the old wives’ tale. Poultry is an excellent source of zinc, selenium, iron, and B-6; all vital for a strong immune system. Salmon – Great source of selenium, B-6, and protein. Cooking salmon in parchment paper is my favorite preparation method. Broccoli – What’s a list of healthy foods if it doesn’t include broccoli? This darling of vegetables is high in vitamin C and folate. Dried beans – Cold, wintry days often beg for a warm bowl of chili or white bean soup. Make a big batch to enjoy all week and you’ll be supporting your immune system with extra iron and folate. Yogurt – Yogurt provides zinc, selenium, and probiotics, the good kind of bacteria that supports a healthy gut microbiome. Some flavored yogurts can be very high in sugar, so choose plain yogurt and stir in fresh fruit or a little maple syrup for sweetener. If you don’t eat dairy, get your probiotics from other sources like fermented vegetables or kombucha. Bonus: Oysters. Probably not a standard food choice here in Montana, but oysters are an incredibly rich source of zinc and copper. They can be a popular choice for Valentine’s Day, so if you’re planning to cook a V-Day meal for your sweetheart, consider adding immune-boosting oysters to the menu. In addition to the nutrients we should be eating, there are also a couple that we should limit if we want our immune system in top form: sugar and alcohol. While saying that sugar suppresses the immune system may be an oversimplification, it’s still a good idea to moderate your intake. The same goes for alcohol. So if you’re getting low on sick days, consider skipping that drink or dessert and eating an extra handful of broccoli instead! Finally, while nutrition is important, let’s not forget the power of frequent handwashing, adequate sleep, and physical activity. It’s also not too late to get a flu shot. Getting vaccinated is still proven to be the best way to prevent the flu. As a dietitian working in the wellness field, nutrition-related news always catches my eye. So I was intrigued when I saw several headlines last summer pertaining to vitamin B3. The first group of headlines were about miscarriage: “Vitamin B3 may prevent miscarriage and birth defects, study suggests” and “Landmark Vitamin Discovery Could Prevent Miscarriages and Birth Defects” Then a second group of headlines appeared, this time for vitamin B3 links to skin cancer prevention: “Vitamin therapy could prevent melanoma” and “New review shows potential of Vitamin B3 in preventing melanoma”. Reading the media-written articles about the research, things sounded pretty promising! However, if there’s one thing I’ve learned as a dietitian, it’s to be skeptical of “too good to true” headlines. So I decided to take some time and investigate the actual basis of the headlines. What I found was surprising, and not in a good way, especially if you went out and bought a bunch of vitamin B3 supplements based on the headlines. For some background info to start, vitamin B3 comes in two forms: niacin and niacinamide. Niacinamide is derived from niacin, but the two forms are nearly interchangeable in low doses, like the doses found in vitamin supplements. In bigger doses, niacin and niacinamide do vary in their ability to treat certain conditions such as high cholesterol. Vitamin B3 plays an important role in our body’s metabolism, helping convert food into usable energy. Good sources of the vitamin in our diet include meat, fish, nuts, mushrooms, and fortified cereal. Now, let’s take a look at the study related to miscarriage. An estimated 10-25% of known pregnancies end in miscarriage, so there could be huge implications for millions of people if the headlines are true and vitamin B3 can prevent miscarriage. Researchers were looking specifically at a group of birth defects known as VACTERL association, which causes abnormalities in many different body systems including the spine, heart, kidneys, and limbs. VACTERL association is rare, affecting 1 in 10,000 to 40,000 babies. Researchers studied four families who had been affected by this particular type of birth defect and found that this association was related to a deficiency of a certain compound in the body known as NAD, or niacinamide adenine dinucleotide. NAD is a coenzyme formed from niacin, which allows cells to produce energy, and which is important for normal organ development. The discovery that NAD was involved and responsible for this group of birth defects alone was a big deal, but then scientists went further and found that when mice with the genetic mutation that will result in VACTERL were given extra niacin, their mouse babies didn’t end up with the expected defects. It was a well designed study and an important one for the prevention of this specific type of birth defect. But, notice that the study was conducted on only four families and mice, and no niacin was actually given to humans! Furthermore, the dose given to mice was the equivalent of ten times the recommended daily amount for people. We also know that body mass index and diabetes can affect how someone produces NAD, and developing fetuses are particularly sensitive little beings. So, while it’s true that niacin may potentially prevent a certain type of birth defects (if humans react in the same way as mice), we are still a long ways off from recommending extra niacin to all pregnant women or being able to say that niacin will prevent miscarriage and birth defects. In other words, it’s an exciting study, but certainly shouldn’t be interpreted as having widespread ramifications for our entire population yet. Next, let’s take a look at the study, or review rather, that spawned the headlines related to melanoma. A clinical trial known as ONTRAC was recently conducted which looked at the effect of niacin supplementation on the recurrence of skin cancer. Researchers found a 23% reduction in basal cell and squamous cell skin cancers (both non-melanoma cancers) when people with a history of skin cancer were given 500 mg of niacinamide twice per day as compared to a randomized control group receiving a placebo. It’s a compelling finding for people with a history of non-melanoma skin cancer, especially since niacinamide is safe, inexpensive, and easily available. However, researchers then hypothesized that vitamin B3 might also be effective in helping to prevent melanoma, based on the promising ONTRAC trial results, as well as the assumed role of vitamin B3 in relation to skin cancer. Vitamin B3 is thought to reduce inflammation and suppression of the immune system caused by UV radiation, and is involved in DNA repair. So, scientists never actually studied Vitamin B3 in relation to melanoma. They just called for future studies. And yet, somehow, their untested hypothesis that niacin might be able to prevent melanoma got translated into headlines that at first glance anyway, certainly give the impression that there is more of a connection. Bottom line? Before you jump on a nutrition bandwagon, and start taking supplements or radically change your diet, dig deeper. Be wary. Find reliable sources. Read the actual study. You don’t have to have an advanced degree to find serious limitations of studies including small sample size, animals only, or no control groups. Or, in the case of the melanoma headlines, no study at all; simply a call for future research! Hopefully we will see follow-up research that support these findings and hypotheses, but in the meantime, the best approach is to get your niacin from a whole-foods based, healthy diet! As fresh summertime produce continues to roll in, it’s a great time to branch out with some new recipes including some yummy, and sometimes not so common, vegetables. For those of you participating in our online incentive program, you can get a jump on a couple of new challenges that will roll out next week (8/14), including watching the following video, and thinking about some new recipes to include in your weekly meal plan. The latest Montana Meals video features four “weird” vegetables that may not be part of your usual veggie repertoire: kohlrabi, eggplant, tomatillos, and garlic scapes. Although sadly we are now past prime kohlrabi and garlic scape season, you can still pick up some great tips, and be well prepared for the next time you find these options! After knowing what to do with these weird veggies when you bring them home, the next step is to decide how exactly you want to prepare them. To help, here’s a roundup of some tasty recipes that use the four veggies described in the video. Happy Eating! It’s been a wild few days, but I can finally sit down at my laptop to jot down a few thoughts and share a few pics. The route I chose to ride across Montana hasn’t been front loaded with cell towers and wi-fi, but in a way that’s a good thing. So far, my adventure has been better than I could’ve scripted, and has exceeded expectations. I still have many miles to go, but right now I couldn’t be happier. The first day of real riding turned out to be a lot harder than I expected. It was uphill, into the wind, and hot. By the time I had done 71 miles and arrived at McGregor Lake, I was fairly smoked. A nice meal and lots of water helped. Despite the less-than-optimal riding conditions, my journey along the Kootenai River and the Great Northern Railway was gorgeous. On Monday, I rolled into Kalispell via an outstanding shared use path created by Northwest Montana Rails to Trails. A few miles outside of the city, I was greeted by an enthusiastic group of a dozen riders from Flathead Valley Community College. It was one of those perfect summer days for riding, and everyone was in good spirits—just excited to be outside, together, and having fun. As we arrived at FVCC, we were greeted by even more employees, and were able to hang out for a while and enjoy some coffee and snacks. I felt overwhelmed and very grateful. Thank you so much FVCC! After stopping at FVCC, it was on to Glacier National Park. At GNP, I met one of my friends who would be cycling with me from the Park. Camping at Apgar, we had our first real weather event of the trip that night. As I lay in my tent, I heard a few drops of rain. “It will just be a quick shower that passes right over”, I thought. Wrong. It poured, for at least 2 or 3 hours. It was a real soaker, but luckily the inside of my tent remained pretty dry. The next day was supposed to be a rest day, but we found out that Going to the Sun Road was closed to vehicles, but open to bikes. We also learned that the road was almost ready, and could open any time. I thought this was a golden opportunity, so we went for it. Instead of resting as planned, my friend Chris and I stared the journey up to Logan Pass. It was incredible. That’s all I can say. That’s all we kept saying all the way up. Some variation on, “This is incredible” or “I can’t believe we get to do this”. If you’ve ever been to Glacier, you know that photos don’t do it justice, but I’ll post some anyway. Zero cars. What a place to ride! Finally, today we rode from St. Mary’s on the east side of the Park to Duyuper. Talk about some wind. Wow. Fortunately, the wind was at our back for about 80% of the ride and we were flying. For one 10-mile stretch, we averaged 26 miles per hour and weren’t even pedaling hard! Unreal. The fast time gave me some much needed bonus downtime this afternoon. Tomorrow it’s on to Great Falls College, where I’ll be stopping for another employee meet-and-greet at 3pm. If you’re in Great Falls, I’d love to see you there! My fingers are crossed for more tailwinds tomorrow! I’m sure the readership of this blog knows that March is National Nutrition Month. I mean, it’s circled on your calendar, right? Well, in case you haven’t heard, National Nutrition Month is a month intended for celebrating healthy, delicious food that nourishes your body. It’s also a month that all joking aside, even as a dietitian, I often overlook. So this year, I am going to be a little bit better, and acknowledge National Nutrition Month with a blog post! To me, the phrase Put Your Best Fork Forward makes me think about the actual act of eating. And not eating just anything, but eating wholesome, delicious food. Sometimes in the world of nutrition, we get so focused on single nutrients or numbers that we lose sight of the bigger picture. We get lost in in the questions like “how many grams of protein should I be getting each day?” or “which calcium supplement is best?” that we forget that nutrition, at its core, is simply about eating good food. It’s about eating consistent meals throughout the day consisting of fresh, healthy ingredients that you actually enjoy. Gone are the days where healthy means only raw vegetables without dressing, light margarines, and nonfat/sugar-free everything. Instead, putting your best fork forward means food that is flavorful, colorful, and most of all, satisfying. It’s roasted vegetables with a generous enough serving of olive oil, salt, and pepper to bring out all the flavors, it’s whole eggs topped with creamy avocado chunks, and it’s your favorite cut of beef savored and served with garden carrots and locally grown whole grains. It’s food that, in reasonable portions, makes us both healthy and happy. Put Your Best Fork Forward also means eating food with a fork. Of course there are exceptions, but for the most part, the healthiest meals (in our American diet and American way of eating, anyway) actually require utensils. Consider foods that can be consumed without utensils — fast food burgers, prepackaged granola bars, snack foods straight from the bag, donuts or pastries, etc. All can be eaten quickly, on the go, in your car, mindlessly in front of the TV, or at your desk as a distraction from work. Now think about a hearty, nutritious meal that has protein, veggies, and whole grains. You need a fork to eat what you just pictured, don’t you? Put Your Best Fork Forward further implies a conscience decision to make good choices. Just as putting your best foot forward means putting forth solid effort and trying your best, putting your best fork forward means you are doing things on purpose to help yourself and your family eat a healthy diet. Good nutrition doesn’t happen by accident. It requires effort. Sometimes this news is discouraging to people. But remember that small actions on a consistent basis, like fitting in 3 servings of vegetables a day or planning out your dinner meals for the week, can produce big results like feeling less fatigued, bringing or keeping your cholesterol and blood pressure in a normal range, or losing the weight that has been creeping up over the years. The other part of making a conscience effort to eat well is to not get too discouraged when you make a poor food choice. Putting Your Best Fork Forward means that each time you eat something is another opportunity to provide your body with the nutrients it needs. So what if you gave into that candy bar craving? Get right back on track with your next bite, snack, or meal. Had a day at work full of junk food? Make an extra healthy dinner at home to balance things out. So this month, in honor of National Nutrition Month, take a moment and consider, what does Put Your Best Fork Forward mean to you? And what can you do today to eat in a way that matches and honors your interpretation? All you good little boys and girls out there have probably put together your holiday wish lists. And although the newest iPhone, or virtual reality set, or new skis might be cool and make you the envy of all your friends, if you are looking to make 2017 your healthiest year yet, consider adding a few of the following items to your holiday wish list. The following are my personal favorite nutrition-related tools that make healthy eating and cooking easier, more enjoyable, and more convenient. Note: I am not getting paid to promote any of these items; this list is a reflection of my personal opinions only. With the exception of the Ninja slow cooker and Glasslock containers, I have no particular brand loyalty on these items. The links are provided as examples only. Chef’s Knife. Every cook needs a great chef’s knife. While there are hundreds of different types of knives to choose from, my favorite is this pink high-carbon stainless steel knife (as seen in Montana Meals videos!) This knife is lightweight, super-sharp, comes with a handy-dandy protector, and is the perfect size for chopping and slicing a variety of vegetables and meats. Really hard items like bones or frozen foods are best left to a butcher’s knife, but I think this knife is a great all-around tool. Slow cooker. Few things are better than coming home after work to a house that smells delicious, with dinner nearly complete. Even better than just a regular slow cooker, the Ninja 3-in-1 slow cooker switches to warm after the designated cook time, can sear meats in the pan itself (no need to dirty an additional pan), and can also function as an oven, using steam to prevent baked goods from getting dry. The Ninja 3-in-1 is pricey, but in my opinion, I think the convenience of this tool is worth the investment. Immersion blender: If you regularly make soups or sauces, or perhaps aspire to, I highly recommend an immersion blender. Avoid burns or big messes when transferring hot liquids from a cooking pan to the stand-up blender by blending the liquid in the cooking pot itself. Glasslock containers: I always suggest keeping healthy foods like pre-sliced veggies in clear containers at eye-level in the fridge, and these excellent containers will help you do just that. The lids seal very tightly, so these are also great containers for transporting your lunch to work. Salad spinner: A salad spinner may take up some precious kitchen space, but it’s an incredible tool when it comes to cleaning greens and keeping them fresh. Forget using paper towels to dry off your greens or herbs; just use the spinner to get rid of excess water after rinsing, then store the greens in the spinner in the refrigerator. Chances are, you’ll eat a lot more salads if you have clean fresh greens ready and waiting for you. Food thermometer: Keep you and your family safe by ensuring that all food is cooked to its proper temperature. There are lots of fancy food thermometers to choose from, but even a basic one will do. Here’s a handy guide on safe food temperatures from the USDA. Digital food scale: I remember buying my first food scale a few years ago because I had just received a cookbook as a gift that had all of the ingredients listed in weights rather than volumes. I never thought when I was buying my scale that I would use it as much as I do! I use my food scale frequently for measuring exact ingredients like flour when baking, when measuring fresh produce from my garden, and when cooking recipes that have ingredients listed in weights. Steamer basket: Steamed vegetables are an excellent, easy side dish. Just fill a saucepan with about an inch of water, place the basket with chopped veggies in the pan, cover, and bring the water to a boil until the veggies are brightly colored and soft, but not mushy. Or, be brave and try steamed collard greens as a wrap in place of a tortilla like in this recipe for collard-wrapped bean burritos. A steamer basket is the perfect stocking stuffer. Cast-iron Dutch oven: Cast-iron cookware is durable, can withstand high oven temperatures safely, retains heat, and unlike nonstick pans, doesn’t pose a threat when scratched. If you’re anemic, using cast-iron cookware is also a good strategy for boosting iron intake. Soups, stews, no-knead bread, beans, risotto, braised chicken, apple butter—the possibilities of what to cook in this pan are nearly endless! Prep bowls: Having all of your ingredients chopped, measured, and ready to go before you start cooking — what chefs refer to as “mise en place”—will help you be a more efficient home cook. These prep bowls of varying sizes can keep your cooking space nice, clean, and organized. P.S. I was just kidding. No one is really buying a virtual reality set right? Power Bite: Cooking with Greens! Here’s the latest in our Power Bite Video Series: Cooking with Greens! This video will be featured on our Incentive Site soon, but we like to give our Montana Moves & Meals followers the first peek! Montana Meals Power Bite: Cooking with Greens! from Montana University Sys. Wellness on Vimeo. Kick a Bad (Sugar) Habit! If you’re participating in the online MUS Wellness Incentive Program, you may have seen a new challenge for March: Kick a Bad Habit. Usually, the incentive challenges focus on what healthy behaviors we can add to our lives, i.e. intense exercise, quality sleep-promoting habits, more water; but this month we’re encouraging you to give up an unhealthy habit, at least for 4 days per week anyway! Many of you are participating in the challenge, and it’s been fascinating to read the comments about which bad habits you’re kicking. There are some unique bad habits listed, like complaining, or getting angry at other drivers, or hitting the snooze button in the morning, but by far the most popular bad habit that you all are working to kick: Eating too much sugar. Some of you are trying to cut sugar out of your diet completely; others are focusing on specific sugar sources such as soda, candy, or sweet breakfast pastries. Sugar is an easy fuel source for the human body. Sugar, in all its various forms, takes minimal effort for our bodies to break down and for the glucose in our blood to rise as a result. Eating sugar also triggers the release of a neurotransmitter known as dopamine, which is associated with feelings of pleasure, reward, and motivation. So why have so many of you resolved to cut back? One reason may be that the 2015 Dietary Guidelines included specific limits on sugar: no more than 10% of daily calories. For someone eating a 2,000 calorie diet, that means limiting sugar to 50 grams per day or less. In teaspoons, that’s about 12.5. It’s estimated that the average American consumes about twice that amount, or 22 teaspoons per day. As a point of reference, a 12 oz. can of Coca-cola contains approximately 9 teaspoons (39 grams) of sugar. If your body requires more calories, you can eat a little more sugar than 50 grams and stay within the guidelines; if you require fewer calories, than you should limit your intake even more. Even if you don’t drink soda or eat candy, it’s easy for sugar from less obvious sources to add up throughout the day. Foods like dressings, sauces, beverages, snack foods, and even breads can contain added sugar. Increases risk of heart disease. Recent research has shown that a diet high in sugar increases risk of heart disease, independent of weight. This suggests that sugar is harmful beyond just its ability to promote weight gain. High sugar intake has been shown to increase inflammation in the body and have a negative effect on cholesterol profile, both of which are risk factors for heart disease. Provides calories without nutrition. Sugar only supplies energy without any accompanying vitamins, minerals, protein, or fiber. Causes tooth decay & gum disease. Increases risk of type 2 diabetes & obesity. Need I go on? These are some pretty compelling reasons to cut back on sugar. It should be noted that this discussion does not include the natural sugars found in dairy and fruit. But it does include other forms of sugar including agave, maple syrup, brown rice syrup, honey, corn syrup, evaporated cane juice, cane crystals, and words ending in -ose like fructose and dextrose. Some sweeteners, such as honey, contain antioxidants; others, such as molasses, contain small amounts of nutrients, so they are slightly better choices, but the bottom line is that they are still sugar. All that being said, keep in mind that a sweet treat every now and then will not kill you. Remember the 80/20 rule of moderation. Sugary foods can make us happy (at least in the short term), and are intimately tied to many of our traditions such as birthdays and holidays. Plus, a piece of dark chocolate has an amazing ability to brighten a day, doesn’t it? But, if you are someone who starts your day with a frappucino and sweet muffin, followed by a candy bar and soda as an afternoon snack, and you wouldn’t dream of skipping dessert after dinner, it might be time to rethink your habits. Read food labels and check out the ingredient list. If sugar (or another name for sugar) is at or near the top of the list, it’s probably wise to choose something else. Try fruit instead. Eat a piece of fruit or handful of berries, fresh or frozen, when experiencing a strong sugar craving. Eat balanced meals that contain protein, healthy fats, and fiber. This will keep your blood sugar more balanced and avoid the blood sugar highs & lows that lead to increased cravings. Skip artificial sweeteners. Research suggests that fake sweeteners can affect our taste for sweets and potentially increase sweet cravings. Plus, artificial sweeteners haven’t been shown to be very effective at weight control anyway. Don’t keep tempting sweets in house, or at least make them less visible or harder to get to. Drink water. Switching from soda, or other sweetened beverages like sweetened iced tea, sports drinks, or energy drinks, to water can make a drastic difference in your consumption of sugar. Keep up the good work this month with decreasing your sugar intake and know that I am right there with you! I’m starting small — I’m focusing on my habit of eating a spoonful of chocolate ice cream while cleaning up from dinner, which often times turns into another spoonful, and then another… Some of you might be able to go cold turkey and cut out most added sugar in your diet, but it’s baby steps for me. P.S. Did you know that March is National Nutrition Month?! Maybe only us dietitians get excited about this month-long celebration of healthy eating, but if you’re thinking about improving your diet, now is the perfect time! This year’s National Nutrition Month theme is “Savor the Flavor of Eating Right”. For some commentary related to the theme, check out my previous blog post here. As promised, here are a few examples of MyPlate meals, or as Neal calls them–“happy-healthy plates”. The March Challenge of the Month is to make your own MyPlate meal and send us a photo of your creation. My examples aren’t perfect, and yours don’t need to be either. In fact, I usually incorporate dairy and fruit into my meals and snacks earlier in the day, so at dinner, they are sometimes missing. The important thing is to think about what you’re eating, consider your food proportions (make room for those veggies! ), make it colorful, and have some fun. 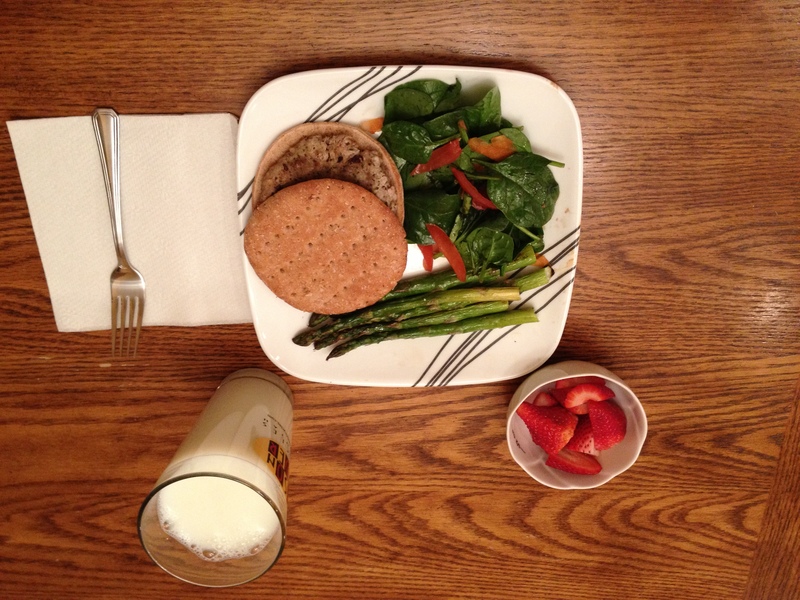 Example 1: Greek turkey burger on a whole wheat bun, roasted asparagus, salad, strawberries, and skim milk. 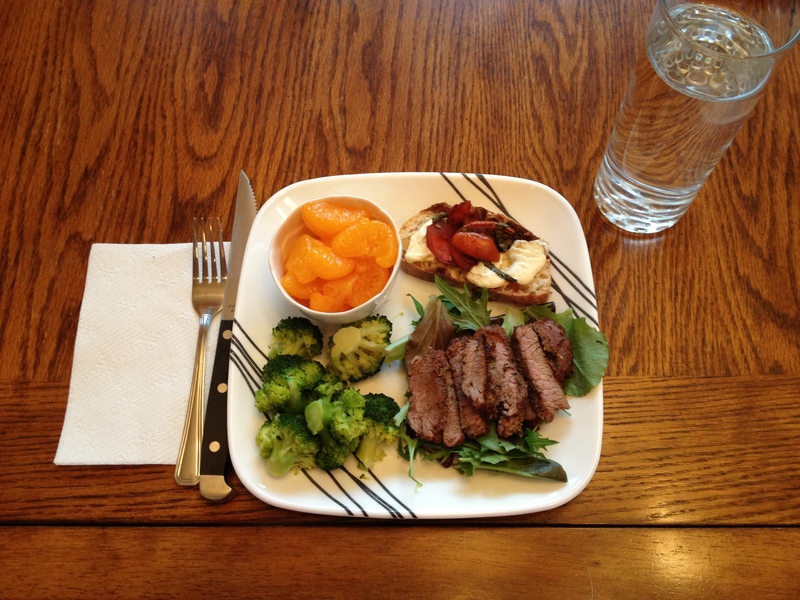 Example 2: Grilled steak, broccoli, bruschetta, and mandarin oranges. Example 3: Lunch time! 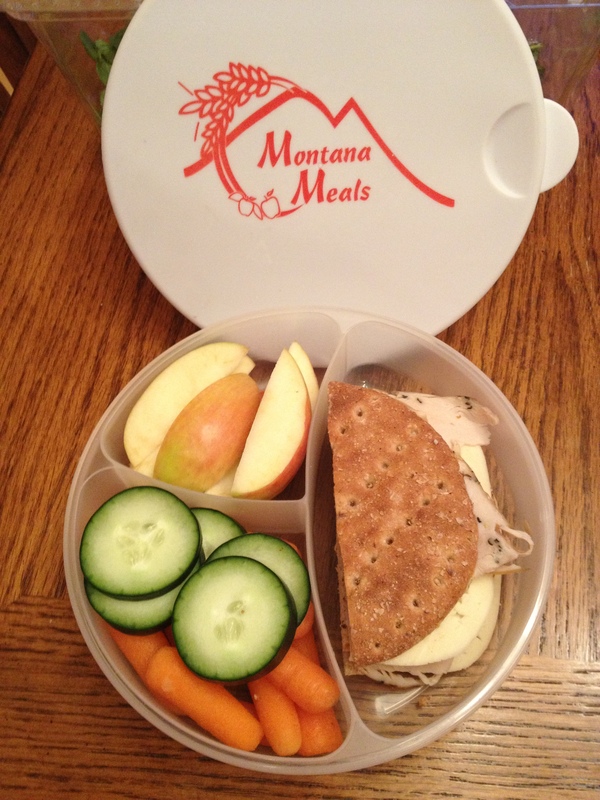 Turkey and cheese sandwich, apple slices, cucumbers, and baby carrots. Featuring our new MontanaMeals To-go plates—pick one up at your next employee Wellcheck! 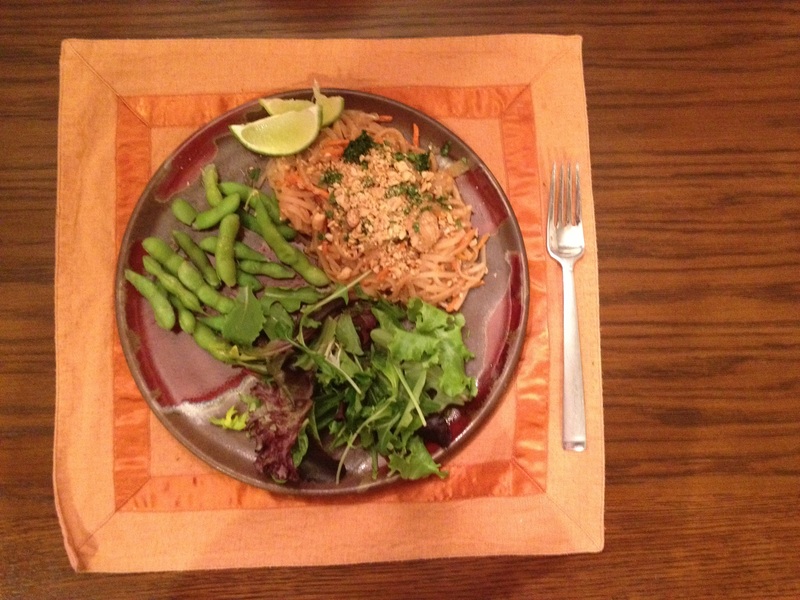 Example 4: Chicken pad thai, edamame, and salad. Example 5: My favorite. 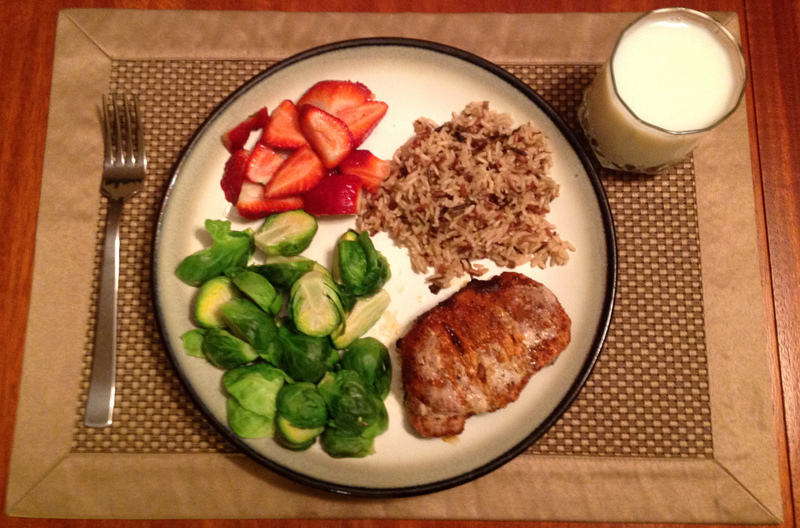 Pork chop, wild rice, brussel sprouts, strawberries, and milk. Thank you Sara Jay from MSU-Bozeman for this beautiful entry! Now it’s your turn! Your meal doesn’t need to be anything fancy; I’ve made plenty of MyPlate meals using simple, convenient food items. You can even try making a healthy-happy plate the next time that you’re at a restaurant. With many restaurants serving oversized steaks and heaping piles of mashed potatoes that together take up 95% of the plate, that might be a true challenge!